When you start the quick bar looks like this. First you got anchor, you can click it and anchor will drop down or be lifted. If your drop or lift your anchor with keyboard key it will also change here. Sails, if you put up half sail, it will turn green with 1 sail on, if you sail with full sails it will have 2 sails on it. You can also click it to raise and lower sail. The helm is to change between keyboard steering and mouse steering of your ship. swords for fence and cannon for cannons, they will light up green on the mode you are on. If you press the lock it will change between safety or no safety. Safety is to not attack own nation. carpenters you got. When it is green, carpenters are working on one of your ships. Learn more about carpenters here. you got. When it is green, it is because you are fishing for food. Learn more about fishermen here. The lighthouse is to set waypoint at the location you are at, or if you are near a city it will add it to the waypoint list. Waypoints can be seen on the in game map at the menu here. make it turn green. When it is green it will send waypoint to all in the team. Learn more about team here. make it turn green. When it is green it will send waypoint to all in the clan. Learn more about clan here. Empty space is to make something of your own in the quick bar. If you don’t have any more free space on the first page of the quick bar you got two more pages that’s all empty. The shift layout 1 and 2 will make the quick bar turn to the two extra pages. You can set keys for shift layout 1 and 2 here. By clicking an empty space you get some options. None is so it is still just an empty space. somewhere else, then the spot they have at beginning. 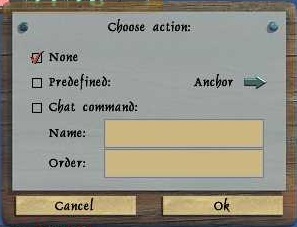 The arrow is to change between the different predefined commands. order what you want it to do and press ok. It can be commands or text you like to say often.